It’s now 8:30am and I am already running late. I have a few things I need to do and a few things I want to do today. Hopefully it will all work out. Some of them may seem unlikely to happen, but with some judicious planning I'll get it all done. At least it looks like the weather will cooperate. By cooperate I mean will not lure me outside. Right now it’s overcast and you can feel moisture in the air. I believe there’s light rain in the southern-most parts of the province. So much for the “no rain all week” forecast. Oh well. It’s better than yesterday. It was so nice it was hard to stay inside at the computer. Really hard. Just another ordinary day in the country, I hope. It's those busy days when you need a recipe that's simple. 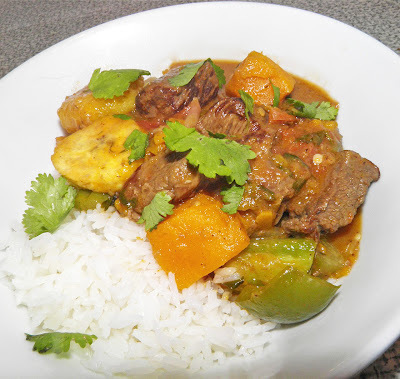 Today’s recipe is an ordinary stew, if you can call tropical flavours ordinary. I try to avoid the ordinary when at all possible. And with a few simple pantry ingredients you can pull this off easily. Just before the final 15 minutes. If you can make beef stew you can make this. The only difference is in swapping out ingredients. Potatoes get replaced by sweet potato; water by coconut milk. And a plantain is added for a fun ingredient. The rest is pretty much kitchen staples – tomatoes, peppers, spices, etc. Even though there’s nothing truly “exotic” in this, it’s far from ordinary. The result is a hearty meal with interesting Caribbean flavours. This went together very quickly and then just did its thing on the stove. It’s a perfect kind of meal to have on a busy evening or weekend when you don’t want to spend a lot of time tending a pot. 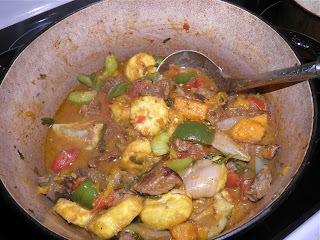 plantain breaks down slightly and thicken the sauce. Heat the oil in a large pot with a lid. Brown the beef, in batches if necessary, and then remove to a plate. Add the onions, garlic and jalapenos. Sauté for about 5 minutes. Then add the beef back in, the chopped tomatoes, sweet potato, coconut milk, cumin, cinnamon, cloves, thyme, bay leaves and lime. Season with salt and lots of pepper. Cover, bring to a boil and then reduce the heat to medium. Let cook for 25 minutes, stirring occasionally. 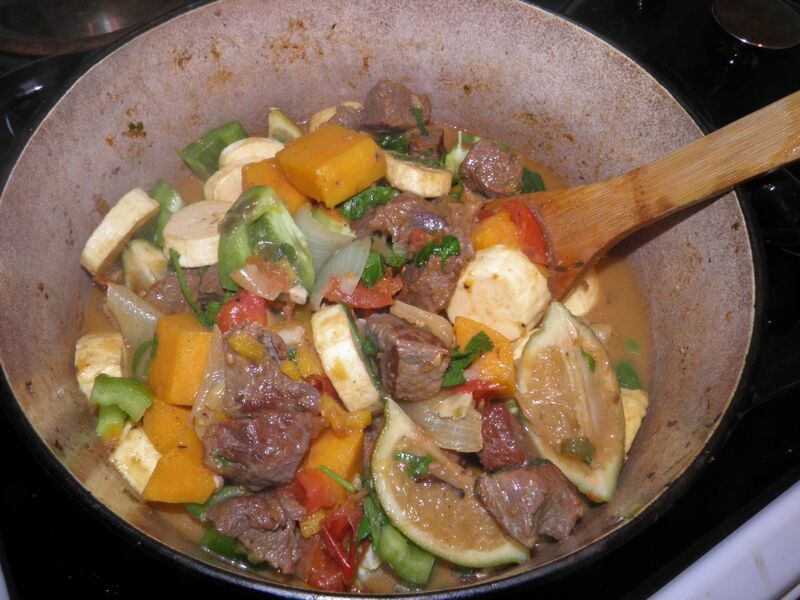 Then add the green pepper, plantain slices and 3/4 cup of the chopped cilantro. Cook for another 15 minutes with the lid slightly ajar. Remove the lime and bay leaves. Taste for salt and pepper and adjust. Serve over white rice with the remaining cilantro sprinkled on top. Mmmmmm. I'm totally making this.